Have you ever reflected on missed opportunities or imprudent decisions that led you to a dead end? 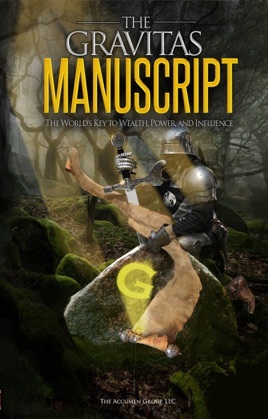 By combining esoteric wisdom and thoughtful guidelines, "The Gravitas Manuscript - The World's Key to Wealth, Power and Influence" will lead you down the right path as you obtain the necessary tools to establish yourself as a prominent figure in society. This manual will serve as your map while you walk through each personal and financial step in a successful attempt to expand your knowledge of self and the world around you. Revealed secrets and truths within "The Gravitas Manuscript" will enable you to examine and understand how your choices can shape your economic and personal successes and defeats. It demonstrates an in depth manner as to how you can decipher between negative and positive decisions, and ultimately how to choose the correct decisions in life that will benefit you most. "The Gravitas Manuscript" is more than a simple self-help book, it incorporates a personal dialogue, much like a mentor, that instructs you whenever you delve into its pages. You will develop constructive methods on elevating yourself, learn how to implement these new plans, and the principles behind why they actually work for you. By understanding the main reasons behind your new game plan, you'll be able to remain effective and diligent on your road to wealth and success. The learning and confidence you will develop from chapter to chapter will equip you with tools and behavior to help you positively face the challenges that arise in life, which will forever change your outlook for the better. "The Gravitas Manuscript" will guide you from beginning infancy into confident maturity and once you begin, you'll never look back.